The Tha Tian Pier was a bustling commuter hub a century ago when Bangkokians depended upon the Chao Phraya River for their livelihood. The advent of the roadways led to a marked decline in river transport services. These days the pier is still functional, but passenger traffic has thinned out. However, the atmosphere remains classic as ever and the pier still stands as a worthy testament to Venice of the East’s riverine way of life in years gone by. Eat Sight Story is a Thai restaurant that’s located right where the Tha Rua Da Pier a stone’s throw from Tha Tian, once stood. 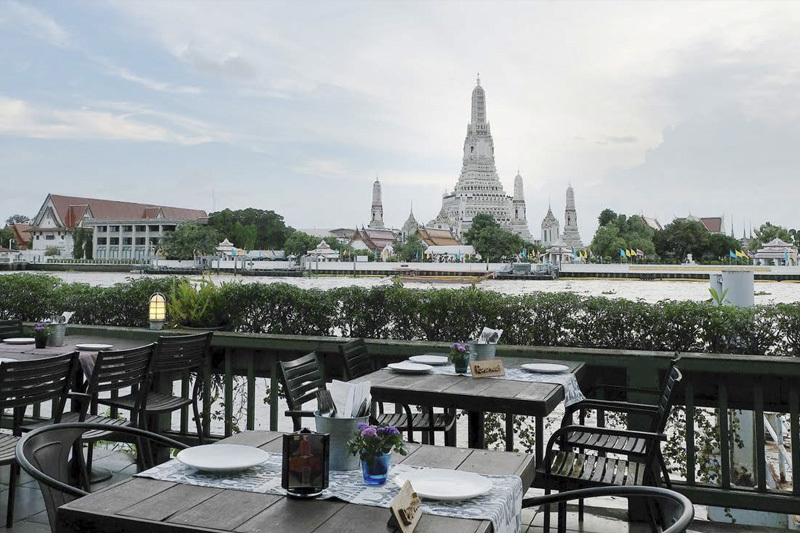 The restaurant – offering a magnificent view of the Chao Phraya River an Wat Arun (just over the river) – is divided into different zones. The menu focuses on fusion food cooked with Thai and imported ingredients catering to different tastes and nationalities. Every dish has a touch of Thainess. the crispy sea bass. The food is styled like a pyramid to whet the diner’s appetite and show off the chef’s creativity. The pancake is quite distinctive: thick and soft with the tantalising aroma and taste of the fish. 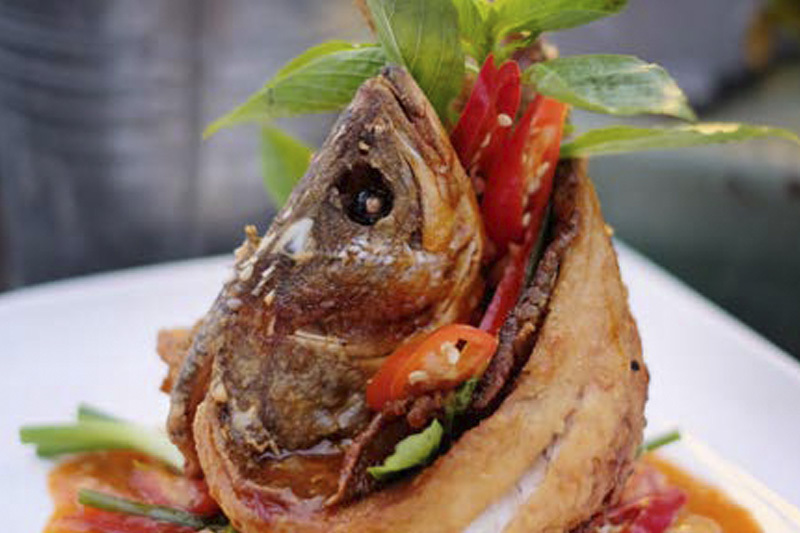 The fish cake is a mixture of sea bass, prawns, young coconut and assorted Thai spices. It’s served with a sweet and sour dip. 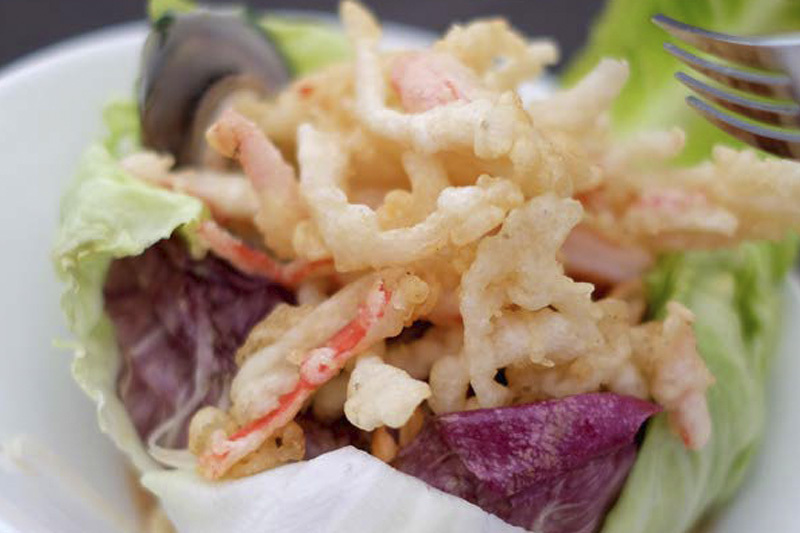 The papaya salad comes with seafood and deep-fried crab sticks. The sweet and sour dish is mildly spicy. The salad features seasonal Thai fruits with prawns, spring onion and lime. 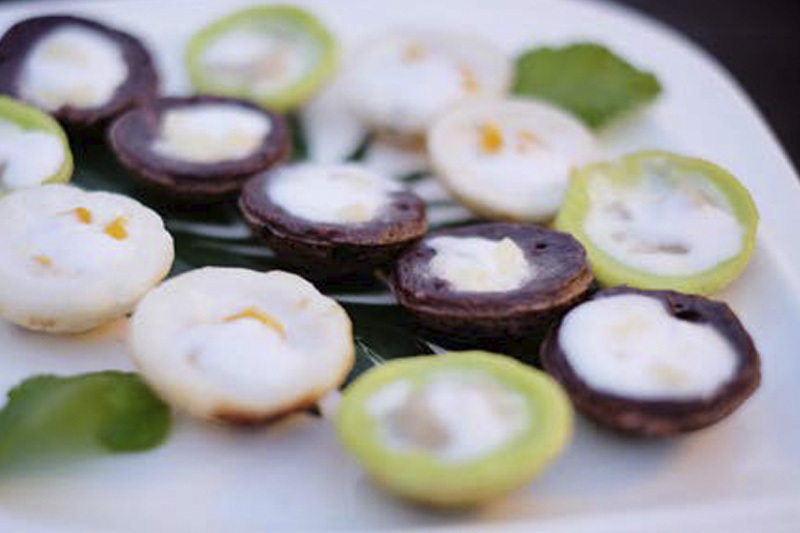 The traditional Thai coconut pudding is a part of Thailand’s street food, reflecting the Thais’ riverine way of life. It comes in the three colours: white from rice, black from glutinous rice and green from pandan leaves. This refreshing colourful mocktail uses luscious pineapple and orange, a great way to slake the thirst. • Located on Soi Tha Tian, Eat Sight Story is open daily from 11.00-23.00. Call 0 2622 2163. The restaurant offers villa-style overnight accommodation.